So, I had the chance to spend a few hours on board of the massive Carnival Breeze. Obviously a few hours is not enough to enjoy the ship. You need a week, but here are my impressions and a few pictures I took. Let’s start by saying that you need a week, yes, you need a week for sure to enjoy this ship. I spent 3 hours on the lido deck having fun, because that’s what it is all about. I actually felt like a kid running up and down the amazing Lido Deck, the water slides took half my time. They were so much fun. Practically everybody left to go explore the beautiful island of Aruba, which left me with the chance to enjoy the ship by myself. It’s the perfect place to go on vacation with your kids or a group of friends. The deck has 2 pools and countless spots to relax and chairs sunbath. I think I counted 4 or 6 jacuzzis. There’s an adult area to get away from the younger generations when you feel like taking a break. There are restaurants, bars, all the food you can eat… burgers, Mexican, Chinese, Italian, a salad bar (YES), Cuban, you have your own wok chef cooking delicious dishes, all the fruit you want, deserts… you name it, they have it. The staff was always so attentive, especially the manager in the buffet area, the kids at the towel kiosk. They have a big screen in the main pool playing concerts, they had Kylie while I was there exploring and snapping pictures. I had the chance to sneak in the Cloud 9 Spa. All the spa services are there and the jacuzzi, the steam rooms… I got the chance to visit 3 rooms and they all have this beautiful wall tilling with different colors on each room. I really wish I had more time to explore and take pictures. There was so much to take in. I’ve never given thought about taking a vacation on a cruise but after this for sure I’m booking a week next year… my only fear is that I will spend more time having fun than blogging about it. 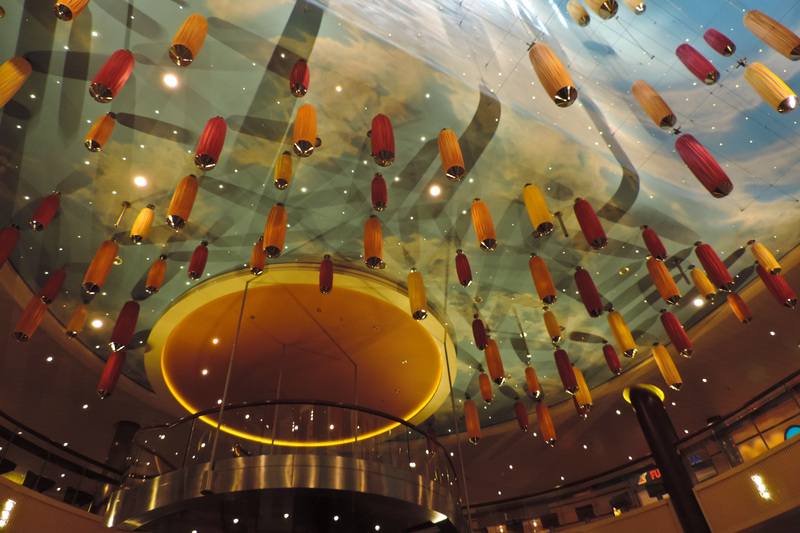 The entire ship is so colorful that you simply will not experience a dull moment, the casino is huge, the main lobby had this beautiful ceiling with lamps hanging, make sure you take the panoramic elevator. There are multiple stores where you can buy merchandise ranging from candy to jewelry to perfumes and gifts. I posted a few pics a few weeks ago while I was on the ship and I know I got many questions from lots of followers, especially from my Snapchat story… You have to come, buy your ticket and take the cruise, I will envy you for sure if you not only get the chance to spend a week but also visit wonderful places in the Caribbean, If you visit Aruba let me know. Special thank you to the PR and Media team from carnival for letting me enjoy the Carnival Breeze. we will meet again for sure!